A Sutherland Presses Technical Sales Specialist focuses on specifying and selling complex metal forming press and turnkey solutions to a wide range of applications for our clients in multiple industries. This role reports directly to the VP of Sales and will be responsible for managing existing clients’ active projects, as well as developing new business relationships for metal forming press sales and service. Day-to-day work will involve advanced technical selling & qualifying of turn-key applications for mechanical, hydraulic, and closed die forge presses, including full production line layouts, press control system options, and integration of any peripheral equipment needs. This role maintains thousands of existing prospects & accounts, and continues to generate leads by cold & warm calling strategic or territorial campaigns. This is a highly competitive field, so excellent sales and organizational skills are a must. Ideal candidates will have a high level of knowledge and experience with metal forming presses, controls systems, and common industry applications. 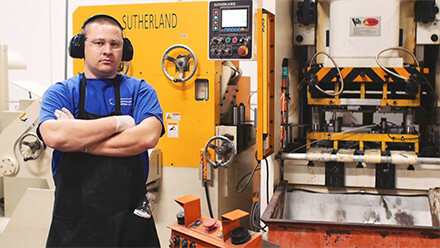 Sutherland Presses is looking for passionate & dedicated team players that are ready for a fun and adventurous career in the metalforming world! This role reports directly to the General Manager & VP of Sales. • Demonstrate advanced technical understanding of industry applications, Sutherland press options, control systems, and turnkey line capabilities. • Provide technical solutions and support to both customers and internal teams. • Hold technical discussions with the customer to identify their specific project needs and determine the best Sutherland solution. • Ability to qualify, sell and close the project or opportunity. • Ensure correct resources are assigned for all projects. • Consistently meet or exceed sales targets in the defined territory. Methods must include strategic and conceptual selling fundamentals. • Identify and qualify target customers or industries requiring the organization’s focus within the defined territory. Qualification should include consideration of the account’s fit with defined criteria and business potential. • Develop and implement sales strategies for major accounts within the defined territory or industry specific campaign. In some cases, this may require a significant level of personal attention on the account. • Ensure that thorough, quality responses to customer requests for quotations and/or proposals are provided on all major opportunities. This may include preparing some or all of the response. • Acquire and communicate information to management about defined markets, customers, product strategy, competitors and the perception of Sutherland Presses in the market. • Work in accordance with defined sales-related procedures, recommend improvements and periodically assist in the implementation of changes to those procedures. • Minimum 2 years’ experience working in technical sales. • Must have excellent sales skills and a proven track record in Machinery Sales & Service. • Be target-driven with a strong desire to achieve results. • Ability to source and cultivate leads. • Ability to communicate clearly with customers by phone, in person, and in writing. • Ability to extract, refine and present advanced press and service requirements. • Ability to quickly gain in-depth knowledge of Sutherland Presses equipment and controls. • Ability to travel as needed globally (Job will be based in Los Angeles).Mechanical or electrical engineering background a plus. • Press Industry experience a plus.Ability to host and present technical information to a wide audience a plus.